This privately run hotel offers large rooms with free Wi-Fi and a 24-hour reception. It stands directly opposite the Neues Rathaus town hall in the centre of Hanover. Each of the non-smoking rooms at the Lühmanns Hotel am Rathaus has its own style. All rooms include a TV and a private bathroom with hairdryer. Fresh beer on tap, fine wines and other drinks can be enjoyed in Lühmann’s Lounge. A breakfast buffet is served each morning with freshly squeezed orange juice. Lühmanns Hotel am Rathaus is a 4-minute walk from the Aegidientorplatz tram stop. It is a 12-minute walk from Hanover Central Station or the AWD Arena. The nearest car park is the Parkhaus Osterstraße (300 metres away). This 3-star hotel in Hannover city centre offers modern rooms and varied breakfast buffets. The main train station is an 8-minute walk away. All of the well-equipped rooms at the City Hotel Hannover feature satellite TV and free Wi-Fi via hotspot. Some rooms have a balcony. Hannover Airport can be reached in less than 20 minutes from the nearby Hauptbahnhof (main train station). The famous Ernst August brewery is just 30 metres away from the City Hotel Hannover. 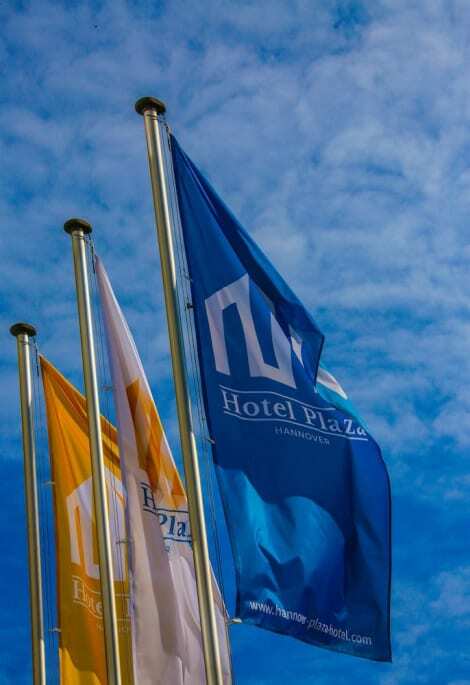 Located in Hannover (Mitte), Hotel Plaza Hannover is within a 10-minute drive of HDI Arena and Hannover Zoo. This hotel is 5.8 mi (9.4 km) from TUI Arena and 5.9 mi (9.4 km) from Hannover Fairground. Hotel Hubertus offers spacious rooms, free private parking and excellent road links. Hanover Trade Fair and Hanover Central Station are less than 5 minutes away by S-Bahn train. Each room at the Hubertus includes high-speed internet, a minibar and a TV with satellite channels. Some rooms include extra-long beds. WiFi is provided free of charge for guests in all parts of the hotel. A large breakfast is provided each morning at the Hotel Hubertus in Hanover. Hannover Bismarckstraße S-Bahn Station and the Döhrener Turm Tram Stop are a 10-minute walk away. Hotel Hubertus provides rental bicycles for exploring the Eilenriede Forest opposite. Maschsee Lake is about 1 km away. Located in the centre of Eilenriede, the “green heart” of the state capital of Hanover, this hotel provides a convenient central situation yet is in a peaceful setting. Here, you are living in an idyllic site on the edge of a wooded forest yet are only a few minutes away from the city centre, which can easily be reached via car or public transport. This is also a popular stop for cyclists and pedestrians in the Eilenriede Park, Hanover’s city gardens. In the restaurant and beer garden area you have free wireless internet access. The restaurant offers seasonal and international cuisine.